I've said it elsewhere, but IMO Dinzag's are the right way to go. Here's the brake down. Dinzag: right height, weight and look. 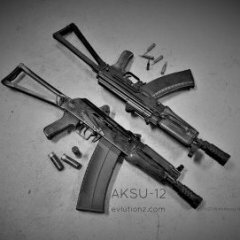 Takes proper AK front post. So you can dial it in for drop with the tool that came with the gun. Clean mounting hardware looks factory, not afterthought. Krebs: has AR front post which I consider a plus becuase that makes night sight options a lot better and more cost effective, and distinct looks. Has nice peep for rear sight. Also a plus. Krebs doesn't usually offer this as a seperate part. I have looked. CSS. AR front post, chunky looks. Probably intended to look right with angluar tromix trigger guards and similar accessories. Works. The one sold on this site, is basically the russian option, but there have been a few. DIY: probably not as hard as you would think to file one out of a chunk of mild steel. IIRC, the rear sight is on an 8mm dovetail. Oh and chaos offers a low profile sight as does Kel tec for their foldy rifle. Those are the best options that I am aware of. I did a lot of overthinking of this a few years back, and the original rear sight is still sitting there. I should probably fix that. For the IZ-109 you want dinzag's low sight if you want to work with the rear sight leaf. The high sight is matched to the IZ-108 vent rib. I have both and they are superb. If you were making a custom rear blade or peep, then there's no reason not to go with the high though. Dinzag. It's definitely the cleanest looking of all the FSB's out there. Is he still doing AK/S12 stuff? Because why give yourself an advantage, when you can try to train past a handicapp? For me, it is a mainly a matter of comfort. I don't like the feel of the recoil impulse when I am all of the way down where I can see the sights and I have fired enough to hit with these things without sights, which is admittedly quite a bit compared to most users. Really though, it doesn't take much effort to point shoot with non-slug loads at close distance with a little practice, assuming it is done fairly often. On top of that, the sights aren't all that generous a means of aiming. After noticing how long it had been since I had actually used sights on these I decided the value of decreased snag potential and a cleaner look was greater than the use of the sights that probably were not where the weapon would hit anyway due to the lack of reasonably precise alignment on these things. I trained past not having sights long before I didn't have them I do have one with sights (IZ-433), but have never fired it. It just sits waiting for me to figure out what to do with it.